Bethesda, MD – ROSS Companies will walk in support of the Cystic Fibrosis Foundation (CFF) on May 15th in Bethesda, MD. 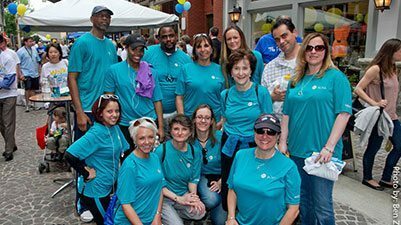 With more than $3,350 in donations raised to date for the foundation, 20 ROSS Companies’ team members will walk in the Great Strides event which will begin at 5:30pm on Wednesday, May 15th at Bethesda Row. Elaine De Lude, Chief Marketing Officer of ROSS Companies, says charitable and community-based activities are very important to the firm. Cystic fibrosis is an inherited chronic disease that affects the lungs and digestive system of about 30,000 children and adults in the United States (70,000 worldwide). A defective gene and its protein product cause the body to produce unusually thick, sticky mucus that clogs the lungs and leads to life-threatening lung infections; and obstructs the pancreas and stops natural enzymes from helping the body break down and absorb food. The Bethesda-based Cystic Fibrosis Foundation was founded in 1955 and is the world’s leader in the search for a cure for Cystic Fibrosis. For more information about the Cystic Fibrosis Foundation, visit CFF.org. ROSS Management Services, an affiliate of ROSS Companies, manages 34 apartment communities in and around the Washington, DC metro area. ROSS Companies, founded in 1983 in Bethesda, MD is a recognized leader in apartment acquisitions and investment, development, property management and renovation. With more than 11,000 apartment homes in its portfolio, the company is one of the most active multifamily real estate firms in the Mid-Atlantic region. ROSS Companies is comprised of three affiliates – ROSS Development & Investment, ROSS Management Services and ROSS Renovation & Construction. ROSS Development & Investment is celebrating its 30th anniversary this year and ROSS Management Services is celebrating its 25th anniversary.